Somehow, he forgave me for that blunder and over the past 35 years we have worked together on research projects, articles, book chapters, journal editing and various committees. Our most extensive time together was in the early 1990s, when he and I were part of the merry band of 12 audiologists comprising the “IHAFF Group.” Over a two-year span, our group had several meetings, some lasting for days, and indeed a final (now forgotten) hearing aid fitting protocol did emerge. If I had to use one word to describe the extensive audiologic contributions of Mike Valente over the past several decades the word would be “relevant.” Whether it’s a workshop lecture, a research article, a book chapter, or an entire book, you can always count on the fact that what you get from Mike relates to practical issues in the fitting of hearing aids, maybe even something that can be implemented Monday morning. You’ll never read a Mike Valente article, and at the end say “Hmm, interesting, but who really cares?” Mike researches and writes about things that we do care about. It is no coincidence that he has been selected to contribute to most every hearing aid Best Practice statement, as few others have the insight to all the critical factors related to the fitting process. And perhaps most importantly, his practical “do-it-the-right-way” philosophy has been passed on to the hundreds of students he has mentored. Some of you readers know that Mike was a classmate of singer/songwriter Billy Joel at Hicksville High School in Long Island, NY. While not well documented, there are rumours that during study hall, Billy and Mike worked on song themes and lyrics together. History tells us that Billy’s story line and lyrics prevailed, but I thought that this might be the time to bring forth Mike’s version of some of the songs that became popular. Until now, most of these lyrics and story lines only had been known to exist on well-stained bar napkins. Billy Joel Version: Includes brief, rapid-fire allusions to more than 100 headline events occurring over a 40-year period. The song is not intended to sound preachy, but rather illustrate what we have inherited, and what we need to fix. Valente Version: Includes detailed description of more than 100 critical issues related to the fitting of hearing aids based on research over a 40-year period. The song is not intended to sound preachy, but rather illustrate what we have inherited, and what we need to fix. Billy Joel Version: A bottle of white, a bottle of red, perhaps a bottle of rosé instead. A story told at a table near the street at a neighbourhood Italian restaurant. About Brenda and Eddie, people who peaked too soon, didn’t make much of their lives, married each other, but then soon divorced. Valente Version: A bottle of white, a bottle of red, perhaps a bottle of rosé instead. A story told at a table near the street at a neighbourhood Italian restaurant. About Mike and Maureen, people who have yet to reach their peak, have accomplished amazing things, and just celebrated their 42nd wedding anniversary! I’ve spent several fun days with Mike, most of them focused on audiology-related issues. However, we do share one avocation other than audiology—a passion for following major league baseball. So, I must say, my most enjoyable day ever with Mike was June 7, 2009. I’m a huge Colorado Rockies fan and Mike is equally fond of his Cardinals. The Rockies were playing the Cardinals in St Louis, and my wife Karen and I decided to go take in the four-game series. The Rockies had won the first three, and on Sunday the 7th, we had brunch with Mike and his wife Maureen before the game. A bad move I thought, as surely this mingling would cause some bad karma to flow the Rockies way. But we won! 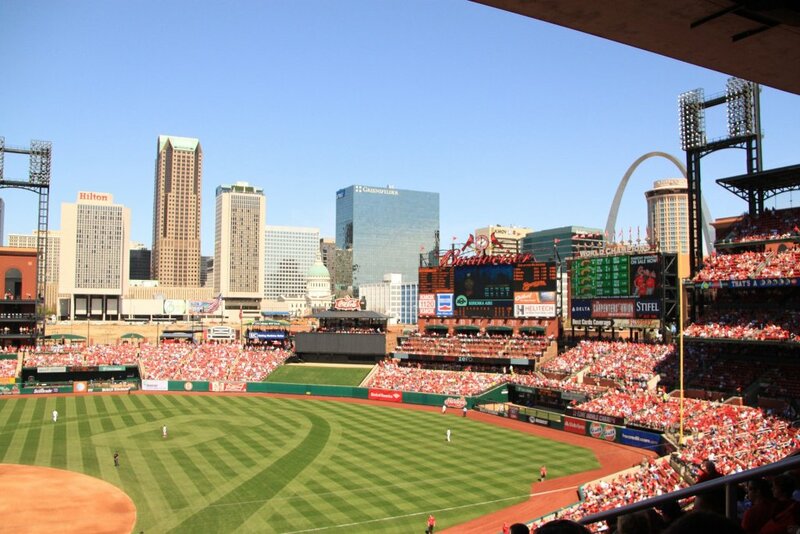 A four-game series sweep against the home team, especially the Cardinals, is a very rare baseball event—I still think of Mike and smile when I see that post-game picture I have of me waving my broom in front of the Stan Musial statue. But actually, it’s easy to smile when you think of Mike, as he not only is a great clinician, mentor, author and researcher, but he is genuinely a good guy. I know that some view retirement as a time for reinvention, another chance to do new things and be a new version of themselves. I sort of like Mike Valentine just the way he is, and will be, very disappointed if we don’t continue to read and hear his audiologic insights for many years in the future. H. Gustav Mueller, PhD, Bismarck, North Dakota, is Contributing Editor at AudiologyOnline and Consultant, Sivantos Group. He has faculty appointments at Vanderbilt, Northern Colorado and Rush University.